Stayed up all night clicking on AirAsia's website trying to score those free (before tax) tickets. I'm going to Jakarta and Hanoi this year! Kids are angels. No matter what they are doing, they can make it so effortlessly cute. I want to imitate, also fail big time. Kenny, What are you doing under the "sarong"? heeheheh.. that was adorable... both of you! btw, who took ur shot? Really cute both of u.
U R CUTE TO ALL THE LADIES. Haha, kids will always be cute! hey, you going to jakarta? when? i think i should video my niece cuteness and share with others too. Anyway, can i know the bckgrnd song title? I know from emil chow but i cant recall the song title. i don't know to laugh or to cringe or to fall in love with you all over again. good soundtrack tho. emil chau! Hehe, Kenny -- your words are absolutely "found in translation". haha! damn funny... ur niece so cute leh~ wats that background song huh? oh my gawd, u r more cute than barney!!! you are so cute in the video....shows that u are on the soft side too! BTW, whose kid is that on the video? ur relative? kennys is forever cute is all our lives ! ! ! whut r da damn thing u count in that sarong ha?? opsss...i tought u r done some gorgeous thing..
your niece is cute when she did that. but you... looks more like King Kong coming out from a cave! HAHAHAHAHA.......!!! Ur niece looks so cute. Awww...You should take a pic together. Kirsten will be so beautiful when she grows up! yea man. i can't see it too. removed? Just in case you're interested, I just did Vietnam last summer. Much more interesting, if you have the time is a night's train ride south into Hue, Nha Trang and Da Nang. Hue is my personal favourite - flew kites with the local children under the ancient citadel (before they stole and ran away with my kite). Sipped Vietnamese coffee and slurped Pho squatting by the roadside, narrowly getting hit by honda ohms. Crusing in a sampan down the Perfume river by the royal mausoleums and pagodas. Ah, reminded me of China 10 years ago - so expect getting ripped off big time. 7:15 PM, 12 January 2007 | Link | Reply . AHH!!!!!! HAM SAP LOU AHHHHH!!!!! i wanna be a kid again!! weeyyy.. can change the way ur bed looks ar? 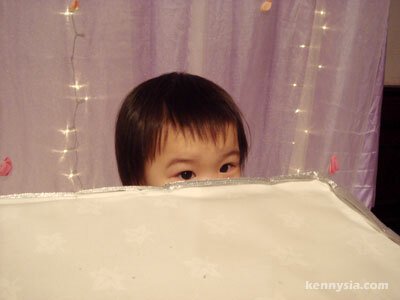 that song is called å­©å­çŽ‹ rite..
Kenny..u are so cute !!!!!!!!!!!!!!!!!!!! act cute is my job leh.. bad Kenny bad bad Kenny. That makes you a complete idiot!! do u get the free tax-less tickets??? U sick boy u. Grow up! The kid is no doubt CUTE!!! i knew that was coming.. but i didn't expect you to actually 'do it'..
have a good day playing cute eh? You did a nice attempt to imitate, but you can't beat that little kiddie! Sext, dear forebearing keeny! :) "Off topic" with special missive to mGf of Catsville, www, can? omg you're so anticlimax at the last part. muahahaha... so funny :P very cute oso.. not u la kenny, the kid i mean kekeke..
U make my day~! Was having quite a moody day..Your video totally lighten me up~! Thanks~! it;s so funny.. one of ur few blogs tat made me laugh like carzzy..>!!! Finally can see the video! The video was loading, so there's lapse with the playing, the moment I saw your niece,... awww,... she's adorable. Her voice is more than music to my ears,.. then your turn,... as I say, video loading,.. then before you took off the quilt,... I predicted and brace for worst,... ha! ha! ha! Not bad lah,.. just as adorable, but a bit of an older version,... he! he! he! Alamak... for me... kinda weird for a good looking guy like you acting like that. Hahahaha... Peace from Kennysia.com's fan. thats really adorable, except for ur part :) just kidding HEH. ! !